For the Octo Expansion mission of the same name, see Turf War (Octo Expansion). Turf War is a mode in Splatoon and Splatoon 2. It is the only playable mode for Regular Battles and during Splatfests. Players must ink the most turf to win the match and are split into two teams of up to four. Turf War was announced alongside Splatoon at E3 2014. It was the only complete mode for people to test out at the time, as only 10% of the game was done at that point in time. Turf War is played by up to eight people, each on their own console. There are two teams of up to four players each, with each team assigned its own ink color. The main objective for each team is to cover as much of the stage, as displayed on the overhead Turf Map, as they can. Players may attempt to splat each other as well to temporarily avoid resistance or for defense. Each team has three minutes to spread their ink. After the timer reaches 0, Judd calculates how much of the stage was covered by each team. The team with the highest percentage of turf coverage wins the round. A bonus 1000p (300p before the final Splatfest of Splatoon) is awarded to the winning team. Stages rotate out every four hours along with the stages from Ranked Battle, at 02:00 UTC, 06:00 UTC, 10:00 UTC, 14:00 UTC, 18:00 UTC, 22:00 UTC. The change in stages is accompanied by an announcement by the Squid Sisters. This announcement also ejects all players out of all lobbies after they finish their current match. Stages rotate out every two hours along with the stages from Ranked Battle, at 00:00 UTC,02:00 UTC, 04:00 UTC, 06:00 UTC, 08:00 UTC, 10:00 UTC, 12:00 UTC, 14:00 UTC, 16:00 UTC, 18:00 UTC, 20:00 UTC, 22:00 UTC. The change in stages is only accompanied by an announcement by Off The Hook when there is either a new game update, a Splatfest-related announcement, or a change in Salmon Run status. This announcement also ejects all players out of all lobbies after they finish their current match. It should be reminded that the player should mainly splatter ink on horizontal surfaces, as walls and other vertical surfaces do not add to the team's score. Walls should only be splattered to get up to high places. 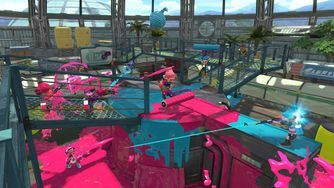 In certain maps, climbable objects are the main vantage point for both teams, allowing players to spray ink further while forcing the opposing team back. Similarly, moving stage elements (such as the spinning platforms in Museum d'Alfonsino and the conveyor belts in Piranha Pit) are scored as they appear at the end of the match. A quick way for players to be able to see who is currently in the lead is to refer to the squid and octopus icons at the top of the screen. As well as displaying player status (active, splatted/disconnected, or not present), if one team is at least 10% ahead of the other team, their icons will appear larger. A "Danger!" icon also appears over a team's icons when the corresponding team is at least 10% coverage behind. If a Turf War ends in a tie, 0.1% will be added to the team assigned as Alpha in Splatoon, therefore making a tie impossible. The game randomly decides which teams are Alpha and Beta for each match, but the host in Private Battles has the ability to assign players to either sides. The Spawn Points are automatically covered in each team's ink, amounting to 6p for each team. This page has been accessed 56,593 times.